Update: Contest is closed! Congratulations to our winner, Mike Saperstein. Let's kick off our week-long series of giveaways with an interactive magic wand from Ollivander's in The Wizarding World of Harry Potter - Diagon Alley at Universal Studios Florida. The prize also includes a signed copy of our new guidebook, Theme Park Insider Visits The Wizarding World of Harry Potter, a 63-page, in-depth look at Universal's new Harry Potter land. You must be a registered member of the website, with a valid email address, and logged into your account, to enter to win. You must not have won anything from or been paid anything by Theme Park Insider in the past 90 days. To enter, simply reply to this thread. Only one reply per person will be counted as an entry. I will pick the winner by selecting one entry at random at the deadline. (I will contact the winner via your email address in your registration profile. If the winner does not respond to me within 48 hours, I will disqualify that winner and pick another one, until I get someone who does respond.) Once we have a winner, I will post that to this page. So when's the deadline? Here's "part two" of what you need to do to win. I will declare this giveaway closed and pick the winner after we get an additional 100 "likes" on our Theme Park Insider Facebook page. Facebook never bothers to recommend our page to anyone, so it's up to you to spread the word. Like our page if you have't already, then urge your friends and followers on Facebook to do the same. Once we hit an additional 100 likes on the page, I will pick a winner from among the entrants on this page. Of course, the quicker that we hit those 100 likes, the quicker this contest closes, meaning the better the odds of winning for those who have entered. So you early entrants have an incentive to help us hit those 100 likes as soon as possible. Get to it, and good luck! Let's Give Away Some Stuff! Here is a positive spell upon you! Happy Birthday. Definitely a cool give away. This is my favorite site to visit, and I try to spread the word about it. Keep up the good work and thank you all for the hard work you do. Would love to win this for my little brother! Thanks for the opportunity! My girlfriend loves Harry Potter, this would make for a GREAT Christmas present! This week is going to be fun with these giveaways! Love what you are doing and would love to win the price to try out the wand this January! I hope i win. I all ways wanted to win a Harry Potter wand. I would love to use it when I go. I cant offered mine owe i bearly have money to buy one. Harry Potter saved my life. I all ways wanted to feel like a real wizard. It will be dream come true. I want to tell people i am wizard and i can do spells. My mom cant get me anything for my birthday they dont have enough money to get me birthday gifts. Cool giveaways. My son would love the wand, he has been a Harry Potter fanatic his whole life. The wand giveaway is a great idea! I hope I win it. nice giveaway thanks! also Belated Happy Birthday wishes!! I'm too cheap to buy one myself, so here's my post. Very nice giveaway and items! love the site and have already liked and shared on facebook. Love this site, always use it when planning a trip to Universal! Happy Birthday, Robert! Thanks for a great giveaway! Would love to use this next time I visit Diagon Alley! Always enjoy your theme park coverage, Robert! Keep it up! Thank you for the giveaway! I'll throw my entry in. Love your site and love Diagon Alley!!! Happy belated Birthday from Cleveland! Another reason to love Theme Park Insider as a source of information. I hope I win. Free stuff is great, but getting more people to read this site is even better. Thanks for editing such a great site!! This is one of my daily website checks every morning to get my Theme Park fix. Thanks for such an informative yet FUN site!! Universal is by far my favorite theme park hands down! I was lucky enough to catch a soft opening of Diagon Alley (all but Gringott's) in July, but I wouldn't let myself splurge on a wand, so I'd love to win this one! Happy Birthday, Robert! Liked, shared, and Joined:) thank you! I'm here to win too. Here's hoping! Thanks for such a great site and such a generous contest! Fantastic Giveaway and a super nice gesture from the Insider!!!! I have a few very serious Harry Potter fans in my house (my kids) that would LOVE this. Love this! Sorry in advance to my wife if I win. Thanks for the giveaway, and as always, great site! What a wonderful giveaway! Thank you for all the amazing work you do at Theme Park Insider. I hope that wand will choose this wizard. would LOVE to win this for our upcoming family trip! Awesome fantastic stupendous prize and I'm going there in a week woot! We were just at Universal last week and I said that I'd love to have one of those wands but I'm too cheap to buy one! Thanks for the giveaway Robert! I sure would love to have a wand! How fun! Would love this! Thank you for all you do and I will spread the word! I am taking my family to Universal Orlando for the 1st time this winter. We would put this magic wand and guide book to good use! Happy Deathday to you, Robert, may it be as rollicking as the 500th Deathday of Nearly Headless Nick! Happy Birthday Robert, and thank you for all the great ongoing content. The site is fabulous. All my friends already like the page! I'm in! This is so awesome! I hope I can win one before this is over! This would make a good Christmas present for my daughter!!! These would be great for my upcoming trip! Looks like a great prize! I've got my fingers crossed for this one! Great prize. Happy Birthday! I have 2 cousins with your birthday too. Would love to win this for my son. He loves Universal and Harry Potter. What a cool prize! Would love to win this! This is such a creative giveaway! Happy Birthday! Looked to Theme park Insider for the best info on the Diagon Alley opening...Great info on Facebook! I wish I had your guidebook two weeks ago, but it would be great to have for my next visit. Awesome prizes, Robert! Would love a wand for my wanderings in the Wizarding World next week! We've gotten about 40 new likes for the Facebook page so far, so we're not yet ready to award the wand. Keep spreading the word! This is a great idea for a contest! That is an awesome wand! Done and done! I took my best friend to Universal at the end of September to experience all of Potter for the first time. He wanted a wand, but decided not to spend the money. If I win, I'm spreading the love! I hope I am not too late! Thanks. This would be great for my trip next month. Thanks for the giveaway. My son would love this. Hope I'm lucky. Happy birthday and thank you for your wonderful tips and insights. I think I am too late, but trying anyway. Wow, so many names in this thread I don't recall seeing on here. I wonder how many new members these giveaways will attract and how many it will bring out of hibernation. Old Ollivander sayeth, "I remember every wand I've ever sold, Mr. Potter. It so happens that the phoenix whose tailfeather resides in your wand gave another feather... just one other. It is curious that you should be destined for this wand when its brother gave you that scar. " Excited about the new book. planning on getting it if I don't win. Remember - the wand chooses the wizard. This would be awesome to get! I've been reading all the great stuff on the site, even if I haven't written to contribute for a while. My kids would really enjoy having a Harry Potter wand, so here's my entry. Lol^ I have never joined the community but I have been a fan since I stumbled onto the page a few years ago. I would love to win this. We are doing a Harry potter themed birthday for my three children. I stocked up on robes last year after Halloween for each child to wear so there will be five from each one. It is going to be an epic party. Awesome giveaway - crossing my fingers!! Has it been given away yet? Pick me Robert! Keep up the good work. Hmmm.... I'd really like a wand! Theme Park Insider giveaway madness! Thanks for all the hard work, love the website, and happy belated Bday! Let's keep making TPI grow! Great prize too! Almost there! Just need about another 30 likes on https://www.facebook.com/themeparkinsider to give away the wand. Please recommend the page with your Facebook friends, if you haven't already! A wand would be an awesome thing to have for my next trip to Universal. That looks terrific, so excited to visit the new land sometime soon! That is awesome! I know a certain young one who would LOVE that! Hello and Happy Birthday Robert! Thank you for a great read day in and day out. Have a trip planned for 1st weekend in December with the God children. They would have a BALL with the wand! We all would! I've enjoyed the content of this site for years; love the contest! Entering! Already bought the book off Amazon. 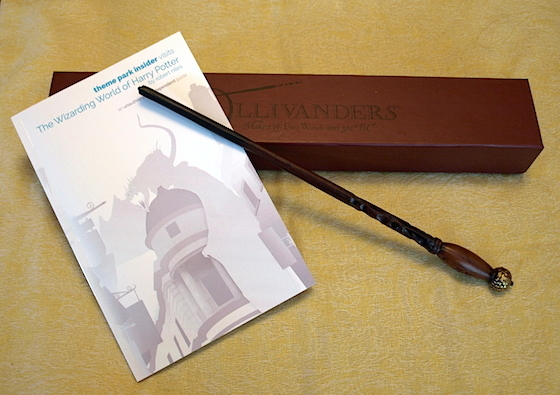 Would love to have the wand, but I'd be more excited for the book! No, really. I don't know that I'll ever get to Uni FL but I love reading about it. I would love to win this. It would be great to have just in time as my fiancee and I are going to Orlando, Florida the 2nd week of December coming up. We have not seen the new Diagon Alley yet, so this would be really cool to win and use around down there. Contest is closed! I've emailed the winner, and am awaiting a response. Thank you to everyone who entered.